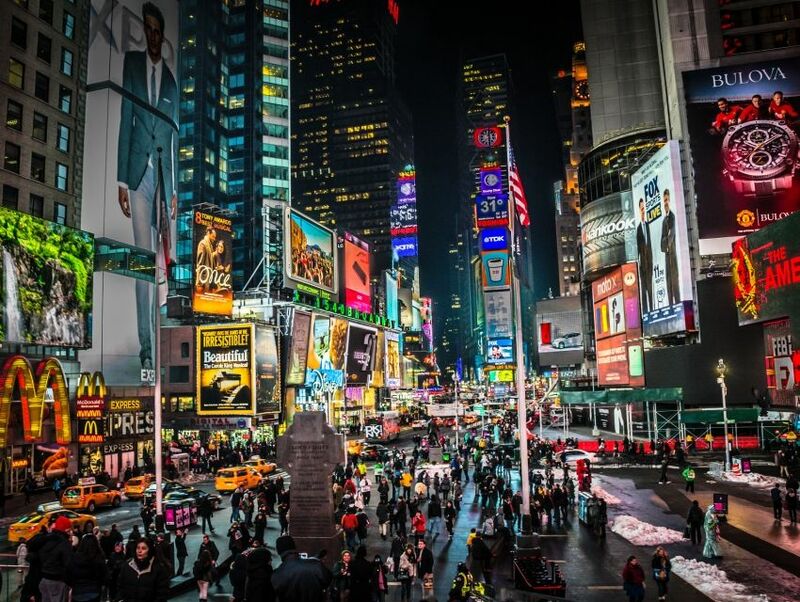 ""The Crossroads of the World""
Larger-than-life billboards, the collective flicker and flash of neon lights, mesmerizing digital screens and a famously atmospheric spirit sum up the allure of the bustling Times Square. Christened after the New York Times, which moved its office to this location in 1924, the vibrant milieu of this busy square deeply echoes the city's ethos. Riveting Broadway marquees, a diverse sea of shops, restaurants of every type and stripe, and towering buildings beyond vie for attention. Somewhere amid a sea of tourists who are likely making their way to the iconic red steps for panoramic views of this spectacle, a big crimson tourist bus inches its way toward the next monumental attraction. Meanwhile, longstanding fixtures of this place contribute to its hugely legendary status, from the Coca-Cola sign, the colossal M&Ms World store and Times Square Studios, to the TKTS booth, the Hard Rock Cafe, and Planet Hollywood.